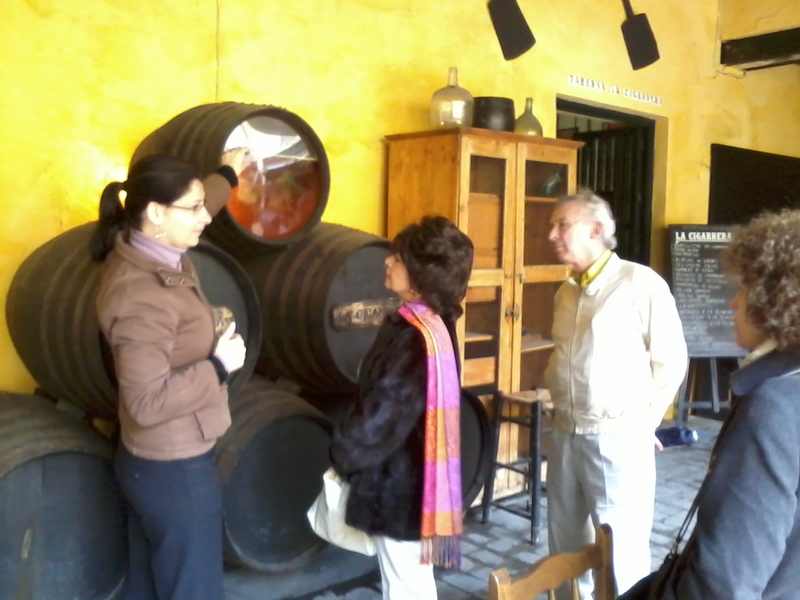 Yesterday, I took a group to Sanlúcar de Barrameda on a wine or sherry tour. We started off with a visit to a small producer that was established in 1758 in buildings that had been part of a convent. They specialise in manzanilla (very normal in Sanlúcar) which is around 90% of their production. 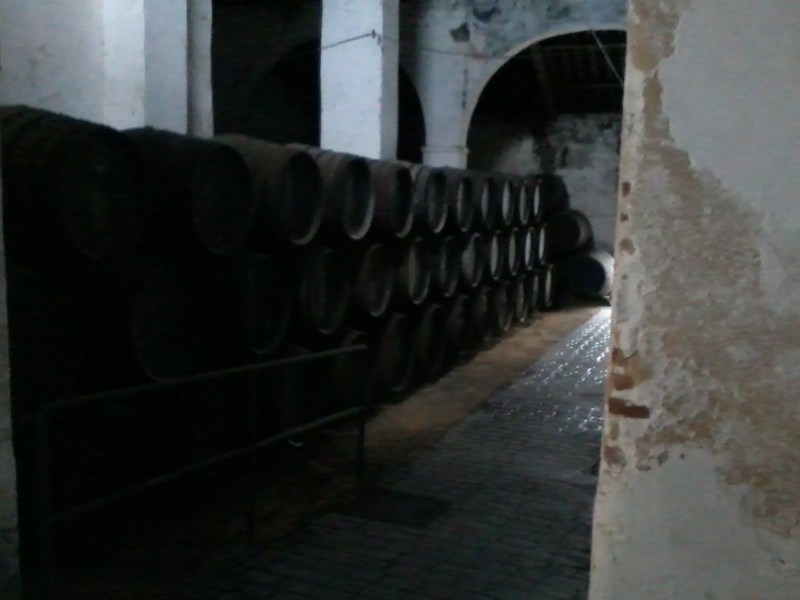 They also produce small amounts of other styles of sherry. Apart from the manzanilla which is excellent, I really like the amontillado they produce. It is a realitvely young amontillado and is very soft and nutty retaining many of the characteristics of a fine manzanilla. The photos that I took at the winery are not of the best quality as I took them with the camera on my mobile phone. In the last photo above my group are being shown a glass-ended barrel where the yeast layer on top of the manzanilla can be seen. 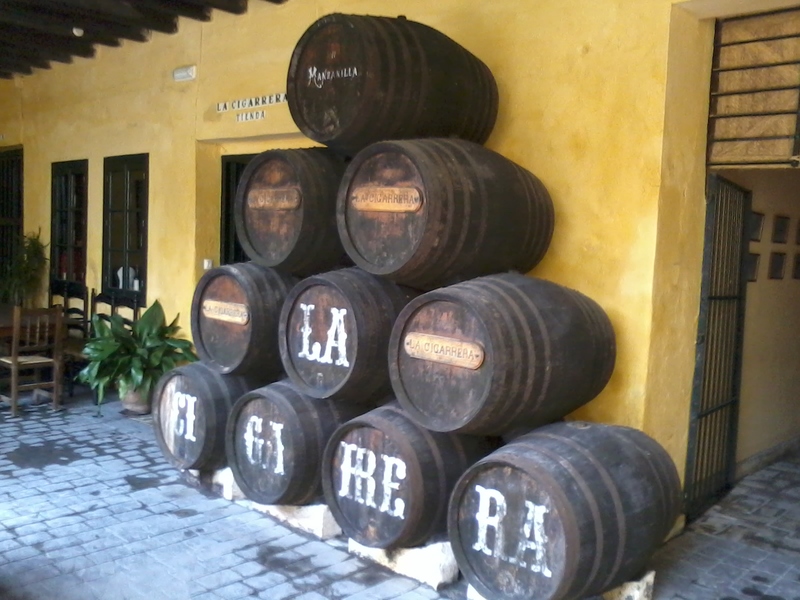 A lot of wineries in Sanlúcar sell their wines or sherries directly form the cask to local customers who show up with a bottle of other kinds of recipient to have them filled. They usually have a glass of manzanilla while they are waiting. In the photo below Nieves is filling a bottle with manzanilla en rama. “En rama” means that it is comes directly from the cask with no heavy filtering, cold stabilisation, etc. This is the best way to drink manzanilla or fino. Some producers now ship small quantities of “en rama” finos and manzanillas. These do have a very light filtering to remove any yeast cells but this in no way changes the characteristics of the wine. A lot of commercial finos and manzanillas are heavily filtered and cold stabilised which in many cases removes their soul. Tasting a fino or manzanilla diretly from the cask and then tasting the filtered bottled version is a real education. Our tour yesterday continued with a vist to another winery which if you look here you can see what I wrote about a visit there on a tour last year. We then went to one of the finest seafood restuarants in the area for a fantastic lunch before heading back to Seville. I arrived home just in time for the Wales v England rugby match in Cardiff. My team, Wales, won 30-3 and played out of their skins. I still have a smile on my face as I write this.